President Ian Khama of Botswana this week wrapped up a national “farewell tour” before he stands down on Saturday in a power transfer designed to stress his statesmanship and the country’s stability. Khama has visited all of Botswana’s 57 constituencies since December, bidding a long goodbye to a population of just 2.2 million after serving the constitutional maximum of 10 years in office. He will be succeeded by Vice President Mokgweetsi Masisi, a full 18 months before elections. Khama’s two terms in power have been defined by his country’s rapid development thanks to lucrative diamond and beef exports and by a reputation for good governance. He has also become renowned for straight talking — breaking with diplomatic convention to criticise leaders including US President Donald Trump and then-president Robert Mugabe in neighbouring Zimbabwe. On Tuesday, his tour finished in his ancestral village of Serowe in the east of the country, with a day of songs, poems, gifts, ululation and pleading for him to remain in office. Thousands of jubilant villagers dressed in blue, white and black, gathered in a kgotla, a traditional courtyard, to hear Khama speak. “I was a soldier, I didn’t have interest to join politics, I had future plans, away from politics,” he told the crowd, adding that his predecessor Festus Mogae had to persuade him to take over in 2008. Khama, 65, has cultivated a down-to-earth image — despite his father Seretse Khama serving from 1966 to 1980 as Botswana’s first president after independence from Britain. Edna Monyena, a village elder in her 80s, lavished praise on the outgoing president, telling him that he was “an honest man, a straightforward man” who showed “real love”. Many elderly female villagers wore blue dresses printed with portraits of Khama’s father, and some used cow bones as percussion instruments as they stood up to sing and dance. 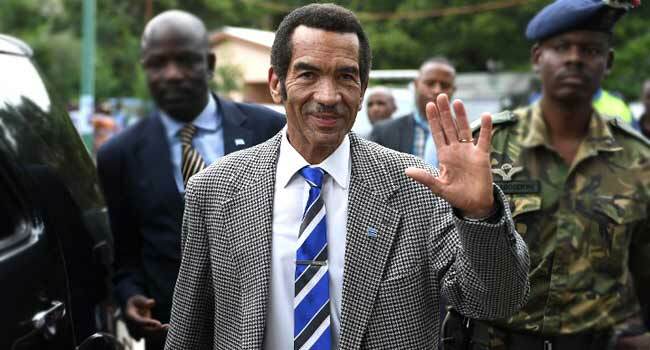 Khama was showered with gifts including a 4×4 truck, 143 cows, hundreds of chickens, over 415,000 pula ($44,000), and a fully-equipped luxury caravan that his brother Tshekedi dubbed a “mobile state house”. The avid conservationist also received a framed picture of a rhino. “I wanted him to be 50 years more in office, I want him to work until the Almighty calls him,” unemployed Sadie Moleta, 23, told AFP in Serowe, where Khama is a chief of the Bangwato tribe. Khama, a former pilot and military chief, demonstrated his outspoken streak when he recently accused Trump of promoting policies that encourage poaching and summoning the US envoy over Trump’s alleged slur against African countries in January. Khama called on Zimbabwe’s Robert Mugabe to step down well before the nonagenarian was ousted, and his government has also urged Democratic Republic of Congo President Joseph Kabila to resign after his term expired in December 2016. The Botswana leader’s on-schedule departure has made a public display of obeying the constitutional term limit. But his own record in office has not been without its critics, who accuse him of an autocratic leadership style. He led the ruling Botswana Democratic Party (BDP) to landslide victories in two elections, although the party won less than 50 percent for the first time in the 2014 vote. Often seen as one of Africa’s success stories, Botswana has recorded rising unemployment since 2009 as diamond prices fell. The drop in revenue forced Khama to halt many planned investments in recent years. “Internationally, he positioned himself as a moral leader in the region, stepping down as an example of a leader who respects laws and traditions — and inviting both President Kabila and Mugabe to respect democracy and the rule of law,” Matteo Vidiri, a BMI Research analyst, told AFP. The opposition blames Khama for creating a society of “beggars”. “He killed the spirit of self-reliance creating dependency through handouts,” Kesitegile Gobotswang, deputy president of the Botswana Congress Party, told AFP. Khama, who is unmarried, was born in Britain as his father married white British woman Ruth Williams — a mixed-race partnership that caused widespread shock in Africa and Britain. Incoming president Masisi, 55, will be inaugurated on Sunday.